The aim of this report is to offer new insights into the possibilities for website preservation. Server-side preservation complements large-scale web crawling solutions with an in-depth conservation approach for individual online productions. The method relies on the belief that digital preservation needs to start with website creators at the pre-ingest stage before the umbilical cord connecting the website to its server-side environment is cut off. Websites are complex ecosystems, most of which lie hidden under the surface of a webpage. A server-side preservation approach aims to include individual components of that ecosystem and dependencies between them in order to preserve a fully functioning and contextualised dynamic website. Since there are few publicly available examples of this strategy, the Netherlands Institute for Sound and Vision has recently initiated research around the subject. This report is the result of a five-month internship exploring the topic. It provides advice for the institute on the server-side preservation of dynamic websites, highlights further steps to be taken and offers a reflection on the challenges that might be encountered along the way. Bocyte, R. (2018). 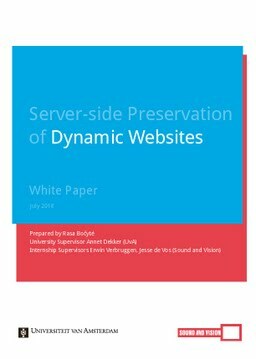 Server-side Preservation of Dynamic Websites. Netherlands Institute for Sound and Vision.